For the fourth year, the National Civil Rights Museum is proud to partner with civil rights activist Ruby Bridges-Hall to present the Ruby Bridges Reading Festival. Get new books for your home library! 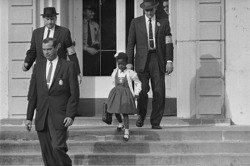 At six years old, Ruby Bridges-Hall was the first black child to attend an all-white elementary school in Louisiana in 1960 when her parents responded to a request by the NAACP to help integrate the New Orleans school system.The Ruby Bridges Reading Festival celebrates Bridges' legacy of passionately advocating for equal rights, education and tolerance by bringing together families across racial, economic and educational backgrounds around reading. Bridges-Hall stated, “As a child, I never quite understood the power of a story until I found myself at the center of one that catalyzed and emboldened a movement. Today it is so important that our children learn to believe in the power of their stories and know what a force for change they can be. Which is why I am honored to have the opportunity to share my experience with the wonder of storytelling joined with the beautiful people of Memphis on the holy grounds of the National Civil Rights Museum."